Folded into lemony muffins, baked into stuffing, stirred into freshly toasted granola and garnishing a spinach salad: we have come up with many uses for the tasty little cranberry. It’s all for good reason. 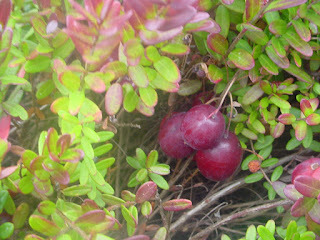 Cranberries are beautiful, nutritious and, around here, plentiful. 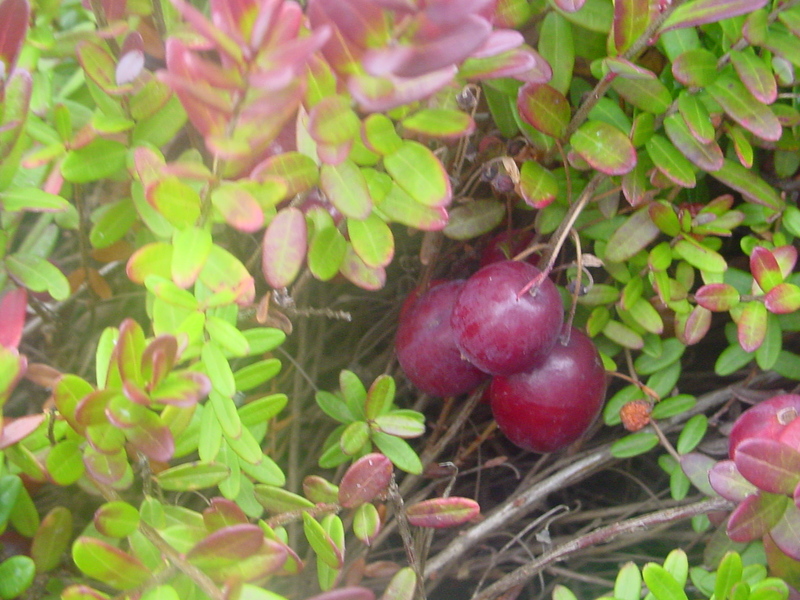 In fact, cranberries grow wild around Nova Scotian brooks and streams and have become an important crop in the Annapolis Valley since at least the 1940s, when the first commercial harvest was made near Aylesford. 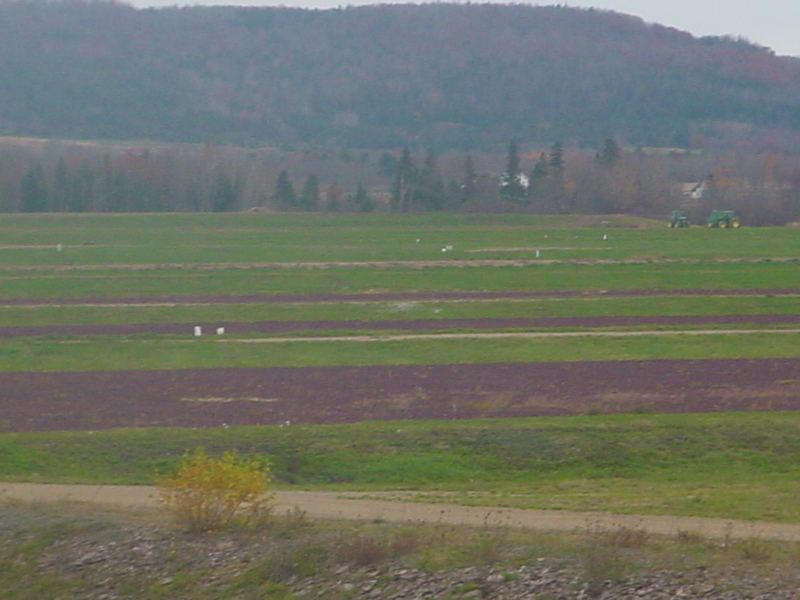 Cranberries have been produced commercially in Nova Scotia since the late 1800s! 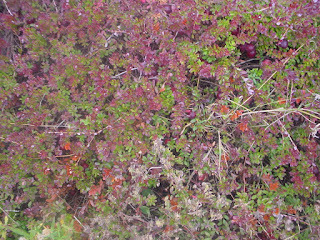 I had a chance to visit my friend Louise’s Cranberry Acres last Tuesday. 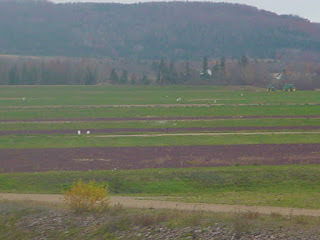 I was amazed at the complex machinery, their acres of irrigated fields, and a complex system of irrigation ponds and ditches designed to flood the cranberry fields on demand (most cranberries are harvested underwater: they float to the surface and are collected). 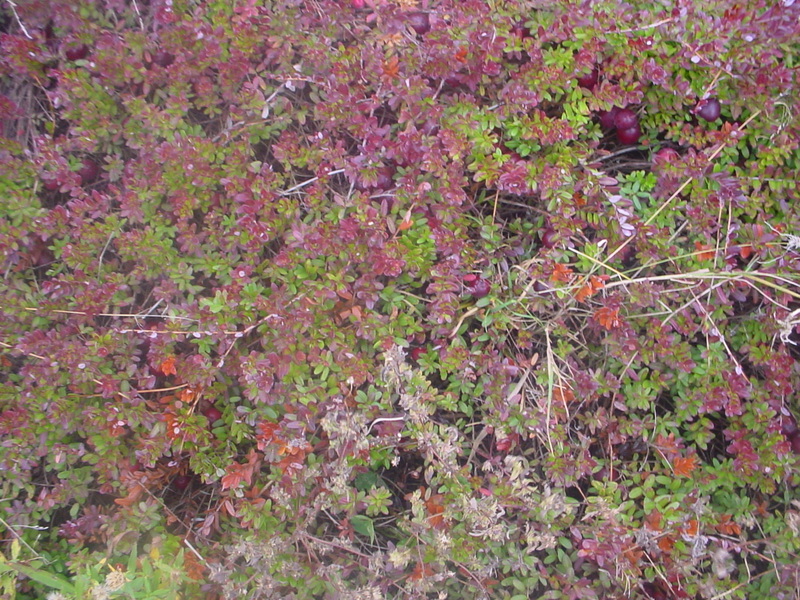 Theirs is one of the largest of several cranberry farms in Nova Scotia, with more than 30 fields under cultivation and five different varieties being grown including Stevens and Pilgrim. On the day I visited, frozen cranberries were being packed in forty pound boxes destined for Russia! Our cranberries are exported all over the world and are renowned for their gorgeous colour: Louise told me that Nova Scotian cranberries are by far the reddest. We’ve been buying fresh and frozen SunValley cranberries for years. For a time, they also supplied us with dried cranberries, but have since discontinued that line. However, we were thrilled to discover an almost-local source of dried cranberries and cranberry juice at Terra Beata Farms in Lunenburg. They also dry and juice Nova Scotia cherries and blueberries! 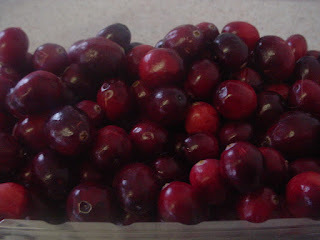 The cranberry harvest will be over soon, but cranberries last for weeks in your refrigerator and longer when frozen. There’s no need for fancy preparation, just throw the whole bag into your freezer and they will be separate and intact when you’re ready to use them. Don’t bother to defrost them either, just be prepared to add a few extra minutes’ cooking time to your recipe. This is our spicier, thicker version of cranberry sauce. At the Union Street Cafe, we serve this chutney alongside our North Mountain Free Rangin’ Hot Chicken Sandwich and our version of Duck Confit. It’s also great mixed with an equal part of mayo and slathered on a turkey sandwich. This chutney keeps at least a week in the refrigerator. Combine all the ingredients in a medium saucepan and bring to a boil, stirring from time to time. Reduce the heat and simmer for 8-10 minutes, until berries have broken down somewhat. Let cool, then refrigerate. Serve this beautiful dressing on emerald Spinach leaves or mixed greens with Roasted Pears, Dragon’s Breath Blue Cheese and Toasted Pecans as a celebration of the colder months of the year! The Cranberry in its Natural Habitat! Preheat the oven to 350°. Toss the cranberries, sugar and salt together on a baking sheet and roast for about 15-20 minutes, until the cranberries begin to shrivel. Let cool, then scrape into a medium bowl and whisk in the olive oil, dry mustard and a few grinds of pepper. Taste and add a splash of balsamic vinegar if you like and thin with a spoonful of water if it’s too thick. If you prefer, puree it in a blender for a smooth result. This is very pretty spooned over greens. This is a tweak on Michael Smith’s Chef at Home Chocolate Chip Cookie recipe! Preheat oven to 350. Butter a large baking sheet or line with parchment. Combine flour, baking powder and salt in a medium bowl. Cream butter with brown sugar in a large bowl until fluffy, then beat in eggs and vanilla. Add flour mixture, cranberries and white chocolate and stir until just combined. Using a 1/4 C. measure, scoop dough onto baking sheet, spacing them out (cookies will spread). Bake for about 15 minutes, until browning around the edges. I read this morning that at the end of “Strawberry Fields Forever”, John Lennon repeats the words “cranberry sauce”.